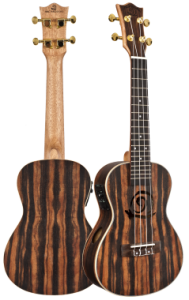 Since the popularity of the ukulele has returned, manufacturers of all stripes have gone out of their way to capitalize on the demand for the instruments. As music teachers, we see all sorts of poorly-made instruments come into our classrooms and studios, and know how discouraging it can be for a student to not be able to sound good on their instrument. Besides...if you're purchasing a classroom set, YOU have to listen to them! Ukuleles CAN be much cheaper than their bigger, six-string cousin, but that does not mean that any cheap ukulele will work well for your classroom! (See this rant on cheap ukuleles.) When I first purchased 4 ukuleles for my classroom to supplement my guitar class, I went with a popular beginning brand. Within 2 years, they were not holding up well. In contrast, the Cordoba ukuleles that comprise my full classroom set of 30 have been used almost daily by middle school students for 4 years now, and most of them look new, and sound great! We also need to be careful to reinforce the idea that the ukulele is a legitimate instrument, and not a toy. Consider carefully whether the pretty-colored "fun" ukuleles are really going to be the best choice - will it cause your class to abuse them in a way that they would not with a "legit" instrument? Will the lack of seriousness implied by the colors make them more approachable, or cause the students to abuse them? That's a question only you can answer - you know your kids. I personally prefer concert-sized instruments for the classroom. They're a nice balance of sound with good projection and a comfortable size for most students, regardless of age. My own 7-year-old plays a concert-sized ukulele with no problems, along with his 11-year-old sister and myself, their *cough* -year-old father! The following brands and models are ones that I have personal experience with, but are by no means the only decent instruments. When possible, try to play a few different models before deciding! You're a musician, regardless if you play ukulele already. You'll know the difference between a good-sounding instrument and not. The sound of a ukulele is heavily influenced by the strings. Take a look at my String Comparison Page for a demonstration of how much of a difference it can make, as well as ideas on saving money in your budget! But don't forget about you! Again, I highly recommend that you go to your local music store and try out as many instruments as you can. You'll find an immense number of web pages that will make recommendations on makes and models of instruments for players, and I won't try to duplicate those. However, I will recommend getting an acoustic/electric instrument, or adding a pickup after you purchase one! Why? Well, so the students can hear your instrument; either as a demonstration of what they are going to play, or so that you can accompany them while they play. Your plugged-in ukulele can even double as a metronome if you tap the bridge while it's plugged in! I normally play a tenor sized ukulele, but during a time that my tenor was in for repairs, I stopped in at a local music shop and came across this beauty. I was smitten, and it's still one of my favorite to play. The tuner is built into the electronics, which is handy in the classroom. Besides the snail-shaped soundhole on the front, there is also a sound port on the side, which allows you to more clearly hear your instrument's sound. Plus, it will look VERY different from the students' instruments, making it easier to distinguish it from theirs. Snail ukuleles are made by Antonio Violins/Amahi Ukuleles in Ohio. I've been very impressed by all of the instruments I've heard from this company. Still one of my favorite instruments, my Gretsch (Roberta) is in the process of retiring, because she's been dropped too many times in the classroom. (Sigh...so much was learned at her expense in the past 5 years...) In spite of the abuse, the sound is great, and the pickup is even better. It's got a built-in tuner, and is the best-sounding electric I've worked with. I've got the same model on review in the running to replace the one I abused. I like it that much. Update: When I got the instrument on review that I mentioned above, there are some differences in the newer model, most obviously in the thickness of the neck. The new one does not sound anywhere near as nice as my old one. I'm hoping I just got a bad one off the line, and that this isn't representative of the newer models. I called Fender (the parent company of Gretsch) and they swear the specs and the factory have not changed. I will likely try another, but I would change my recommendation to "make sure you play before you buy". This is in the running to replace the Gretsch. Another one with great sound, and it has a nice pickup on it. I still think the Gretsch pickup sounds better, but the finish & prep work is better on this one. All the fret edges are nicely filed so there are no sharp edges, and in general is more elegantly put together. What if you didn't get an acoustic/electric or can't find one you like, but still want to be able to plug in to an amplifier in the classroom? All it takes is a $1 door alarm from a dollar store, an $3 input jack, a couple of wires, hot glue, and some minor soldering, and you've gone electric!